Roses have become more popular than ever with the development and promotion of vigorous, disease resistant shrub roses. I remember my father being quite smitten with Carefree Beauty (also known as Katy’s Road Pink) when it first came out in the late 70’s and early 80’s. This rose was extensively promoted to be carefree, and useful for massing and hedging. 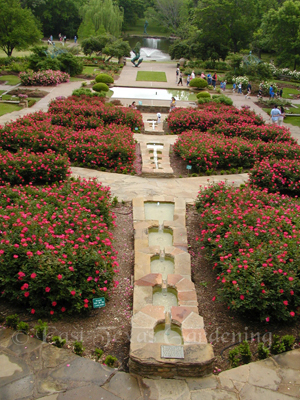 This was growing roses for a landscape effect rather than for the exhibition of highly bred hybrid teas, which had a well-deserved reputation of needing a much higher level of care, especially pruning. Then along came Knock Out at the turn of the century, and suddenly anybody could grow this tough, forgiving and floriferous rose. And it was planted everywhere!! Of course, Tyler was the center of rose production and processing for decades, with hundreds of acres of field-grown roses, producing the latest hybrid tea and floribunda roses grafted onto a species rootstock Rosa multiflora. When I arrived in Tyler in the early 90’s, Dr. George Philley, an Extension Plant Pathologist at Overton, was working with rose growers to learn more about a rose disease known as Rose Rosette Disease that affected the multiflora rootstock, eventually killing both the root stock and scion variety. Most rose production in Tyler now is by cutting propagation (called "own root roses") so there is no multiflora rootstock involved. 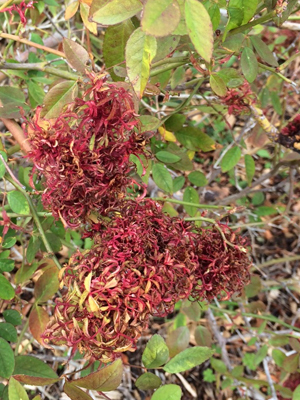 Rose rosette is a viral disease that was known in the upper Midwest as early as the 1940’s for its ability to infect and control wild multiflora rose - a hard-to-kill woody weed of rangeland. Despite Tyler being the Rose Capital, since the advent of Knock Out and other similar shrub/landscape roses, I have hardly seen any Rose Rosette Disease in home gardens nor in the acclaimed Tyler Rose Garden for the last 15 or more years. That’s the good news. However, in the last several years, this disease has become a major problem in the Dallas/Fort Worth and surrounding area, plus many other areas in the lower South, including all the way to Washington D.C.
What prompted me to write about Rose Rosette was a text and photo from my friend Clint Perkins in Wood County, where plant showing symptoms just showed up in a long- established planting of Earth-Kind roses planted in Mineola. With this being the time to prune back roses, and buy and plant roses for your yard, I wanted to help make you aware of this disease and to be on the lookout for it. Hopefully, it will not become as problematic in East Texas as it currently is in the Dallas metroplex area. Rose Rosette Disease (RRD) is a virus that is spread by an eriophyid mite - a very, very tiny arachnid, and can also be spread through grafting. Once a rose has this virus, it will eventually die, though it could remain without symptoms for a fairly long period time. There is much research currently being done to study this disease, and hopefully develop better strategies for growing our National Flower. Lots of symptoms characterize RRD: extreme redness (more than what is typical for a particular cultivar), witches broom (growth of a tight, brush-like cluster of plant shoots), excessive thorniness, rubbery thorns, etc. An infected plant may, or often may not, have all of these symptoms. To help prevent the spread of this disease in your landscape, I think the #1 cultural practice is to space your roses far enough apart so the mites that carry the virus (if they present) cannot travel from plant to plant simply by walking. That means knowing the average spread or width of whatever variety of rose you purchase, and planting them so they will not be touching when they reach mature size. Remove confirmed or symptomatic plants quickly, including as much of the root system as possible. Bag and discard so any mites present do not escape or spread. Treat adjacent plants with a miticide to reduce the probability of the mites spreading to other plants. Use abamectin or horticultural oil (apply thoroughly, especially on the growing points). Note that this will not stop the virus if it is already present in the plant. I think another cultural practice to lessen the attractiveness of rose plants to the mites is to not heavily fertilize your roses. The mites preferred feeding site is the brand new growth, at the base of the leaf petiole where they are well protected. The less succulent growth there is on the rose bush, the few feeding sites there will be available to the mites. This is speculation on my part, but I think it has merit. Here is a link to a YouTube recording of recent seminar in Plano concerning the present state of knowledge of RRD, presented by Dr. Kevin Ong, Director of the Plant Disease Diagnostic Lab at Texas A&M in College Station. Dr. Ong discusses the disease in a way that is easy to understand. And here is a shorter video by Dr. Greg Church, Collin County Extension Horticulture agent, that has great photos of what RRD looks like in various forms. Here is a link to an article called “Rose Rosette Disease Demystified”, written in 2014 by Dr. Ong and others involved in RRD research. Bottom line is, if you like roses, buy and plant them with confidence for your yard. Buy from a quality nursery, learn their mature dimensions, and don't crowd them together. Better yet, use roses as delightful, fragrant and colorful accents along with your green shrubs, perennials and annuals. I just purchased and planted 5 Drift roses for a newly renovated bed in my yard, as a great border accent.